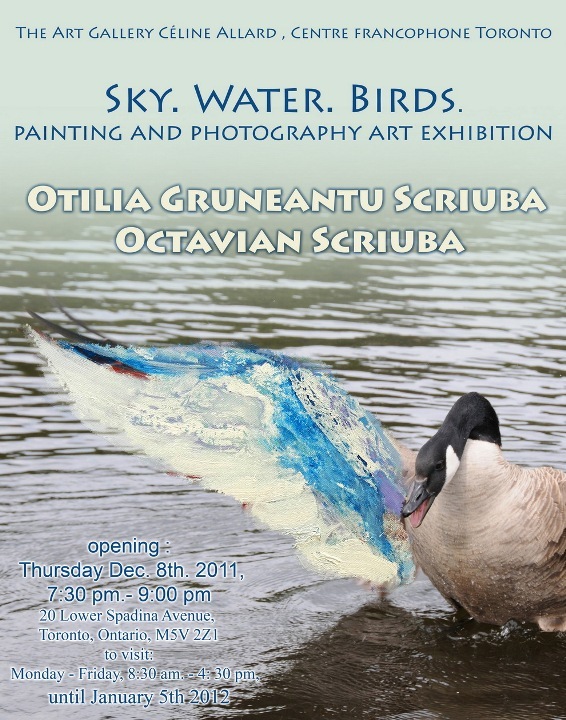 Otilia Gruneantu Scriuba and Octavian Scriuba are pleased to invite you to honour the opening of their painting and photography art exhibition “ Sky. Water. Birds.” on Thursday, December 8th, 2011 from 7:30 pm to 9:00 pm at The Art Gallery Céline Allard, Centre francophone Toronto, 20 Lower Spadina Avenue, Toronto, Ontario, M5V 2Z1. A snack will be served. The exhibition can be visited Monday to Friday from 8:30 am to 4:30 pm until January 5th, 2012. Free admission. We are looking forward to see you there. Please invite your friends as well!